In this article, we’re going to see CSS Grid in action by creating a responsive multi-column website layout. CSS Grid is a new, hot trend in web development these days. Forget about table layouts and floats: a new way to design websites is already here! 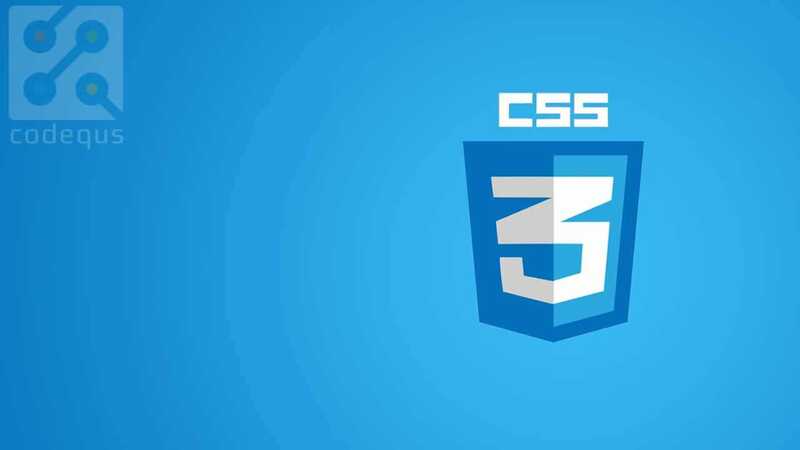 This technology introduces two-dimensional grids which define multiple areas of layout with a handful of CSS rules. 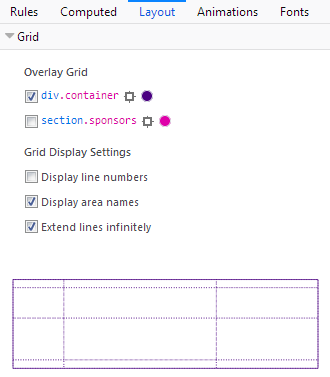 Grid can make third-party frameworks such as 960gs or Bootstrap grid redundant, as you may easily do everything yourself! This feature is supported by all major browsers, though Internet Explorer implements an older version of the specification. Until recently, floats were considered to be the best option to create such layouts. Prior to that, we had to utilize HTML tables, but they had a number of downsides. Specifically, such table layout is very rigid, requiring lots of tags (table, tr, td, th etc), and semantically these tags are used to present table data, not to design layouts. 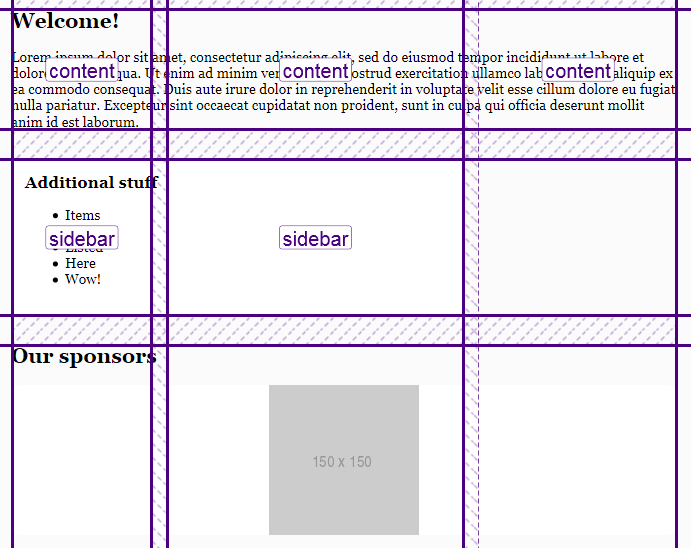 But CSS continues to evolve, and now we have CSS Grid. Conceptually, it’s similar to an old table layout but can use semantic HTML elements with a more flexible layout. .container is the global wrapper that has small margins to the left and to the right. 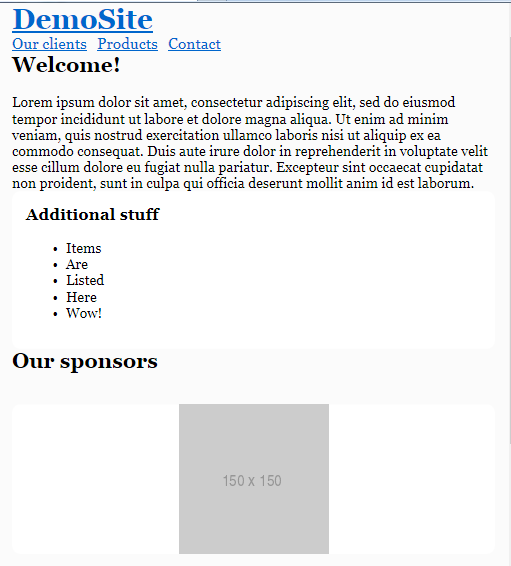 .main-header is the header that contains the .logo (occupying 20% of the space, floating to the left) and the .main-menu (occupying 79% of the space, floating to the right). The header is also assigned a hacky fix to clear the floats. .content-area-wrapper wraps the main .content-area (occupying 66.6% of the space minus 1rem reserved for margin, floating to the left) and the .sidebar (occupying 33.3% of the space, floating to the right). The wrapper itself is also assigned with a clearfix. .sponsors-wrapper contains the logos of the sponsors. Inside, there’s a .sponsors section with the display property set to table. Each sponsor, in turn, is displayed as a table cell. .footer is our footer and spans to 100% of the space. &copy; 2018 DemoSite. White&amp;Sons LLC. All rights (perhaps) reserved. So, I propose having three columns (highlighted in red) and four rows (highlighted in blue). Some areas, like the logo, are going to occupy only one column, whereas others, like main content, are going to span multiple columns. Later we can easily modify the layout, move the areas around, or add new ones. 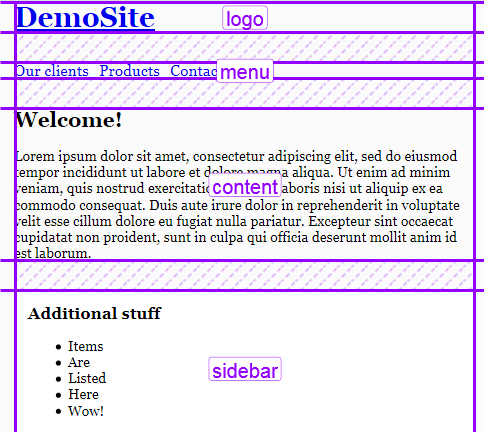 display: grid defines a grid container and sets a special formatting context for its children. fr is a special unit that means “fraction of the free space of the grid container”. 2 + 6 + 4 gives us 12, and 6 / 12 = 0.5. It means that the middle column is going to occupy 50% of the free space. Good! Now we can proceed to the first target, which is going to be the header. With CSS Grid, however, things are going to be simpler: we won’t require any CSS hacks. What’s going on here? Well, by saying logo only once, we’re making sure that it occupies only one — the left-most column. menu menu means that the menu occupies two columns: the middle and the right-most one. See how straightforward this rule is! So, we’ve dealt with the header, so let’s proceed to the main content area and the sidebar. 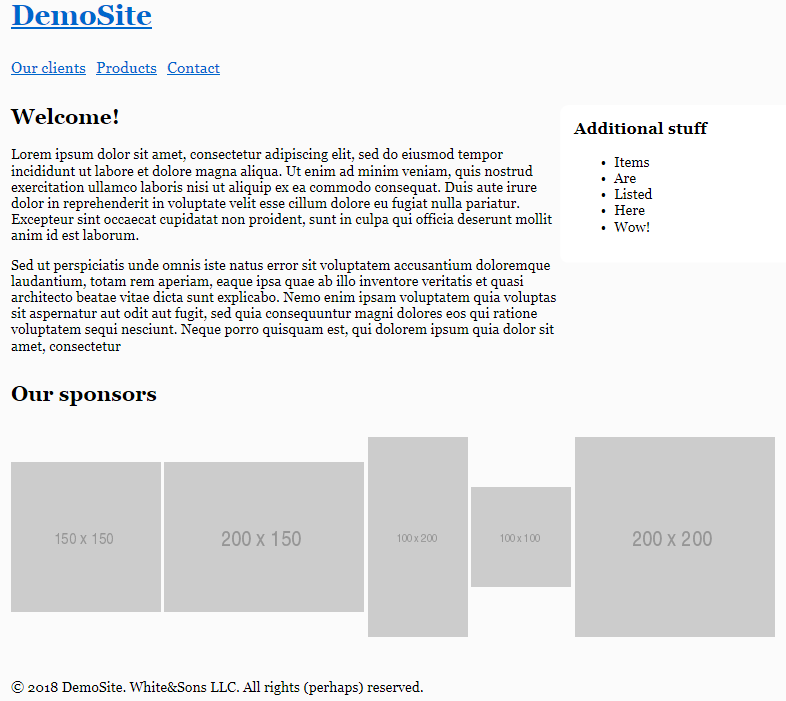 The sponsors section should contain five items with equal widths and heights. Each item, in turn, will have one image. 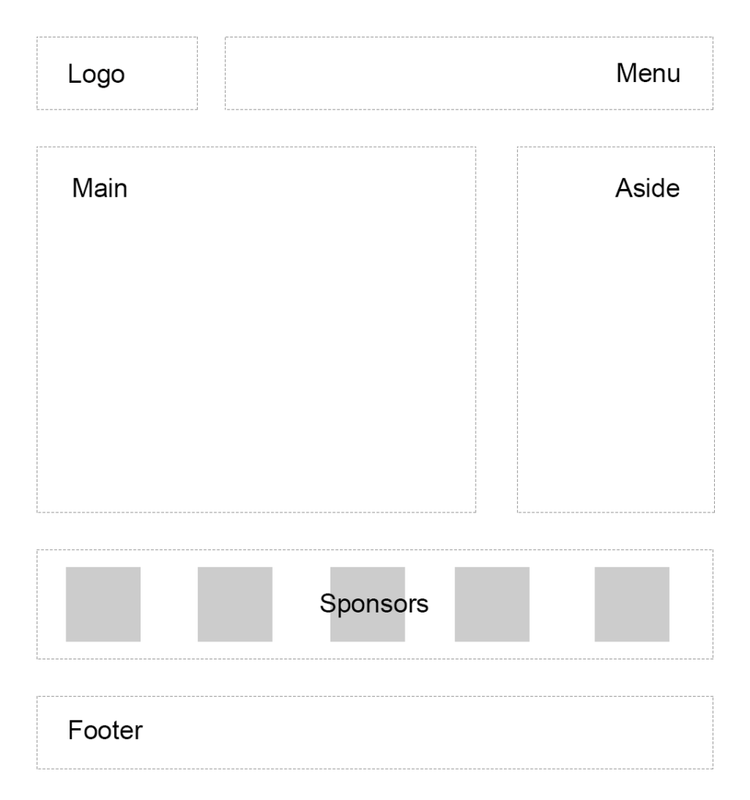 In the initial layout, this block is styled with display: table, but we won’t rely on it. 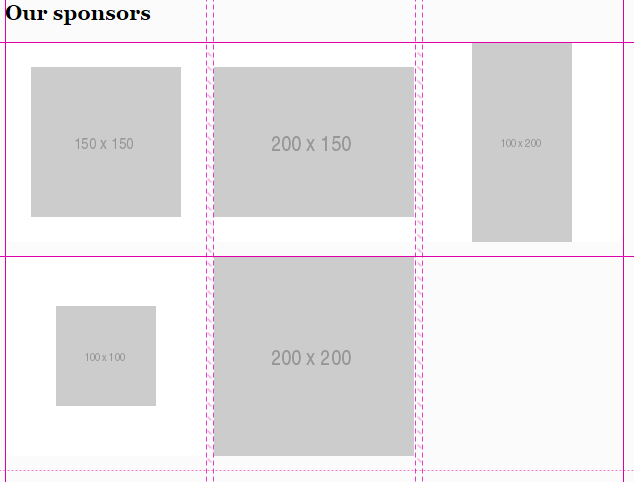 Actually, the sponsors section may be a great candidate for applying CSS grid as well! This example illustrates that you can nest grids without any problems. 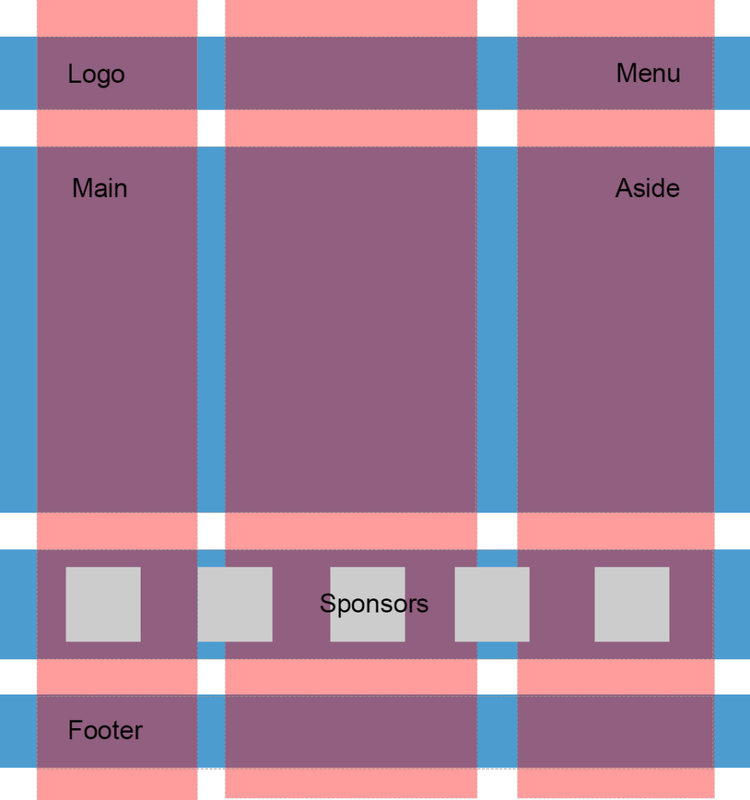 Another solution might be using Flexbox, but in this case the sponsors may wrap if there’s not enough width for them. place-self aligns the element on the X and Y axes. It’s a shorthand property to align-self and justify-self. Basically, the layout is finished! However, we’re not done yet: the site also has to be responsive. So, let’s take care of this task in the next section. Having CSS Grid in place, it’s actually very easy to introduce responsiveness, because we can quickly reposition the areas. The repeat function, as you already know, repeats the columns as many times as necessary. auto-fill means “fill the row with as many columns as possible”. If there’s not enough space for the column, it will be placed to the next line. minmax allows us to specify the minimum and maximum value for the columns’ widths. In this case, each column should span 1 fraction of free space, but no less than 200 pixels. Of course, this isn’t the end of the world, as the site is still usable, but let’s add at least some fallback rules. The good news is that if the element is floated and also has grid assigned, the grid takes precedence. Also, the display, vertical-align, and some other properties also have no effect on grid items, so let’s take advantage of that fact. But having added these styles, our grid layout will now look much worse, because the width property isn’t ignored by grid items. This can be fixed with the help of the @supports CSS query. IE doesn’t understand these queries, but it doesn’t need to: we’ll use it to fix the grid! In this article, we’ve seen CSS Grid in action and utilized it to redesign an existing float-based layout. Comparing these two solutions, we can see that the HTML and CSS code of the “grid” solution is smaller (not counting the fallbacks, of course), simpler, and more expressive. With the help of the grid-template-areas property, it’s easy to understand how individual areas are laid out, and we can quickly reposition them or adjust their sizes. On top of that, we don’t need to rely on various hacky tricks like clearfix. So, as you see, CSS Grid is a great alternative to floats, and it’s very much production-ready. You may need to provide some fallback rules for Internet Explorer (that implements an older version of the specification), but as you’ve seen, they’re not very complex, and in general the site is still usable even without any backwards compatibility at all. 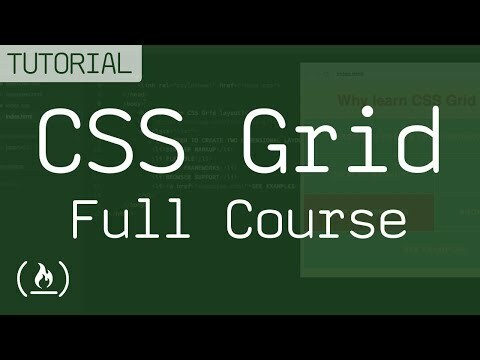 Have you already tried creating websites with CSS Grid? What are your impressions? Share your thoughts in the comments!